This was Arden’s fourth Listener mathematical puzzle, although it’s been over eight years since his last. Over at Magpie he has set a fair few, with some word puzzles thrown in for good measure. What was worrying was that the mathematicals seemed to be D- or E-graded! Anyway, not much to say this week from me as a holiday is imminent. Also not much to say because it was a fairly straightforward solve, and probably a B- or C-grade in Magpie terms. Tackling the 2-digit entries first got the puzzle underway, and it was fairly soon that the primeness of entries was revealed. Mind you, the title pretty much gave that away — although the Wiki article on Free-Trade Primes seems to have gone missing! 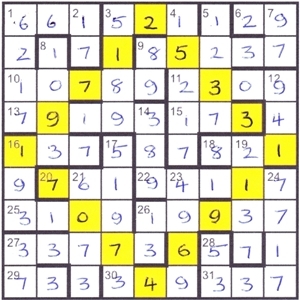 I don’t know how easy the puzzle would be without knowing that all entries were primes, if indeed that were possible. It certainly helped me, though. To assist, I created a table showing, for each clue, both the limits for the sums of two squares and the factors for the products. For example for 11ac 57 (4): the sums ranged from 29+28 through to 56+1 with the associated entries being in the range 1625 – 3137; the factors are 1.3.19. 11ac turned out to be 10²+47²=2309. I hope I’ve explained that adequately. 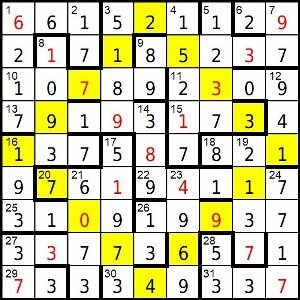 Suffice it to say, it enabled certain integers to be discarded as generating sums of squares that were too large or too small, or not having factors to produce an entry to fit with digits already in the grid. It was an ideal mathematical for me: not too difficult but requiring a lot of patience and analysis. The endgame was pretty straightforward as well. Most 9-digit rows and columns were divisible by 3, a couple were even, and the other two wouldn’t have been symmetrical. It was the two diagonals that were the culprits: 617984977=21791²+11964² and 933181037=25331²+17074². Thanks for a relatively gentle puzzle, Arden.